NVIDIA is going to launch their GeForce 900 series cards based on the Maxwell core architecture on 19th September and while we don’t have any credible information regarding the specifications yet, VIdeocardz managed to get some interesting numbers based off 3DMark entries of the upcoming chips including the mobility parts. The NVIDIA GeForce GTX 980 and GeForce GTX 970 are the high-end Maxwell parts for this year, featuring the GM204 core architecture. NVIDIA has still to show us the GM200 and GM206 cores but they have already given us a glimpse of their efficient Maxwell architecture on the GM107 based cards. The first two Maxwell cards, the GeForce GTX 750 Ti and GeForce GTX 750 were entry level chips but now we are moving into the performance sector which consists of two cards, the GeForce GTX 980 and GeForce GTX 970. Some specifications which are already confirmed include a 4 GB GDDR5 VRAM running across a 256-bit bus interface. Just the standard amount of memory and bus you would consider from the GK104’s successor. It’s going to be efficient in terms of power consumption and performance output and from the numbers that the source was able to gather, it looks like the GM204 might just end up standing against the fastest Kepler GPU currently out in the market, the GK110. In several reports previously, I specifically mentioned that the it’s not NVIDIA’s way to release a sub standard replacement for a card that’s been in the market for about a year. It’s been speculated by several that the GTX 980 might not be able to compete against the GeForce GTX 780 Ti but the results which I am looking at show the opposite. Now I can’t speak for their credibility but the results were taken from 3DMark’s own benchmark database and from my own sources, the cards have already been handed over to AICs since a few weeks who are already running internal tests on the card. Hence you can expect more leaks and performance numbers from now onwards. Before we talk more, let’s take a quick glance at the performance chart compiled by Videocardz which show that they did put some hard effort into getting all that data together. There are mobility chips too but we will look at the desktop cards first. Now before we say anything, I just want everyone to take note that the stock or reference clock speeds for these cards are not confirmed and there’s a huge variation between each speed the card was clocked at. Compared to a stock GeForce GTX 780 Ti, the GeForce GTX 980 clocked at 1127 MHz core was 10% faster which was something we estimated earlier yesterday. The GeForce GTX 780 Ti scored 11096 at stock while the GeForce GTX 980 scored 12328 points at 1127 MHz, 12847 points at 1178 MHz, 13005 points at 1190 MHz. To sum it up, at the highest clock speed of 1190 MHz, the GTX 980 turned out 15% faster than the GeForce GTX 780 Ti and 14% faster than the Radeon R9 290X. The memory is toned to the standard 7 GHz clock we saw on the last Kepler parts. 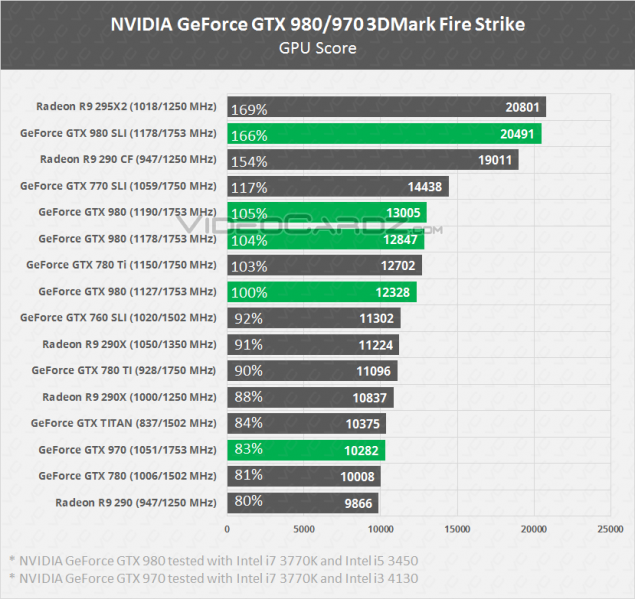 The GeForce GTX 970 results are even more surprising since the card would be available at $399 US and from the looks of it, it will be able to offer GeForce GTX Titan like performance while being around 5% faster than the Radeon R9 290 however can’t say if these are the reference clock speeds or overclocked. The testing setup was odd based on the Core i7-3770K rig and Core i3-4130. So it’s advisable to wait for official or more in-depth results since the drivers aren’t even optimized yet for launch however the testing was done with the upcoming 343.91 drivers. So taking all these things to account, the GTX 980 and GTX 970 do provide some good results in the end. 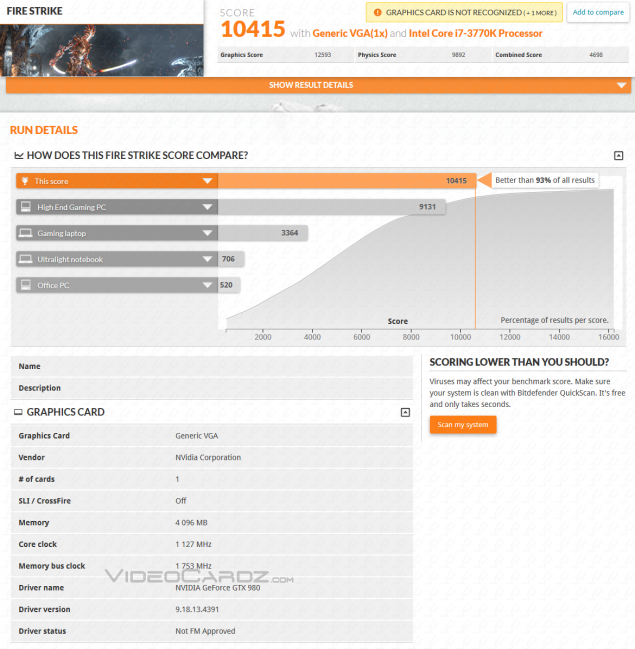 An SLI score can also be found which shows a score of 20941 points at 1178 MHz clock speed. This is faster than the Radeon R9 290 Crossfire setup at stock speeds and reaches just the standard amount of performance you would expect from the Radeon R9 295X2. Both the SLI GTX 980s and Radeon R9 295X2 will be available for $999 US however, the promotion on R9 295X2 might end soon and revert back to its original pricing of $1499 US. NVIDIA GeForce GTX 980M and GTX 970M – Mobility Performance Goes The Highway! Finally, I mean if you want a real comparison of the GM204 than this is the right place and I’ll thank Videocardz twice for posting this benchmark even if the results are based off preliminary data. The mobility sector reached a still point where we saw three generation of chips rebranded after one another. 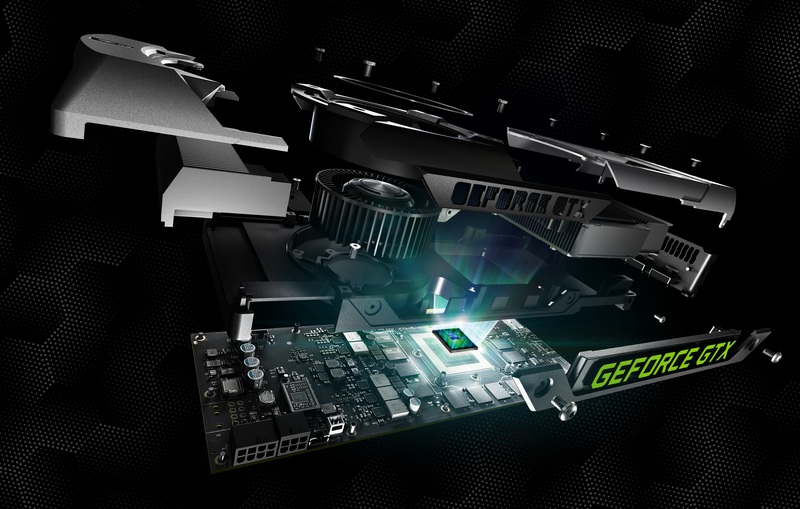 The GeForce 600M became the GeForce 700M and that became the GeForce 800M. Same happened with the Radeon side, the HD 7000M became the HD 8000M and that became the Radeon R 200M series. The only reason we are looking at such big differences in the performance of these cards compared to the desktop ones is due to milking out a generation after generation. The GeForce GTX 980M and GeForce GTX 970M are based off the GM204 core architecture which replaces the high-end GK104 Kepler alternatives which have spanned three years in the market. The clock speeds are not confirmed for these either but the memory clock has been geared down to 5 GHz from 7 GHz for the mobile parts. Just comparing, a GeForce GTX 980M to the GeForce GTX 880M shows a good 35% performance increase which shows how much efficient Maxwell is against its actual Kepler based predecessor (GM204 vs GK104. 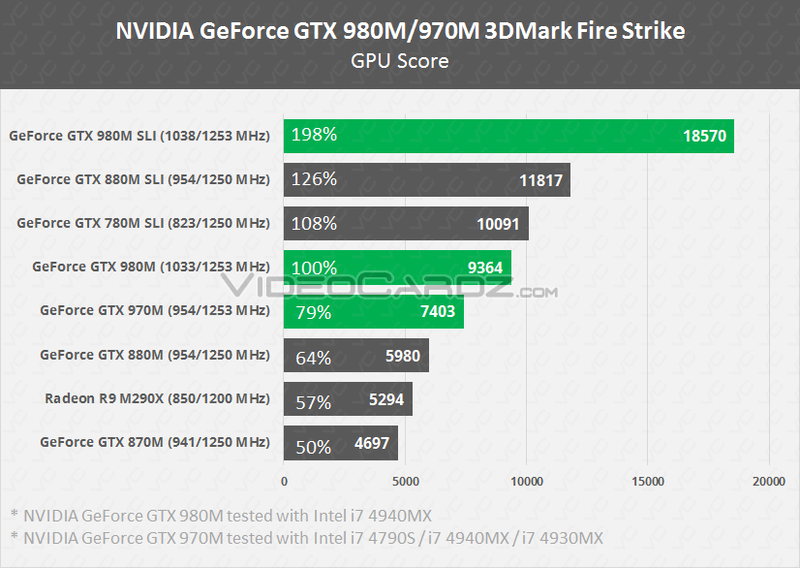 The SLI results torn away the GeForce GTX 880M SLI with a 72% performance increase. The GeForce GTX 980M ships with 8 GB of GDDR5 memory while the GeForce GTX 970M surprisingly comes with just 6 GB VRAM which hints at a cut down bus interface since 6 GB doesn’t scale right with a 256-bit bus. The difference hence against the GTX 980M is larger on the mobility side as compared to the desktop front. While this article is based of preliminary data, it does get some things straight that GM204 is indeed faster than the GK110 GPUs featured on the GTX 780 Ti. We will still wait for more verified and proper information to hit us during the road to Maxwell.